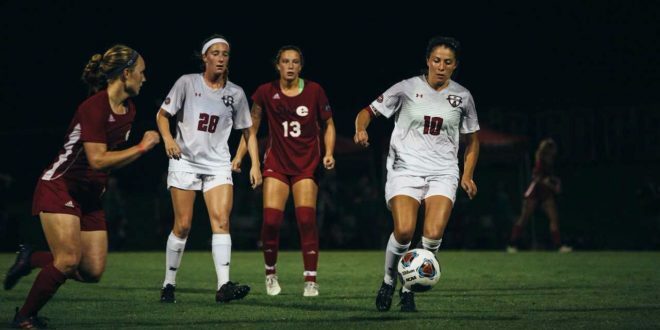 APSU soccer (6-3-1, 2-1-1 Ohio Valley Conference) recorded their second win in conference behind two second half goals. The Govs defense shined with their fifth shutout of the season. Eastern Illinois (5-5-1, 0-3 OVC) was held to one shot on goal for the night. Sophomore keeper Mary Parker Powell’s efforts created four consecutive goalless games. The Govs came close to opening scoring in the 43rd minute when senior Sophia Fabbro close-range-header forced a super save out of EIU’s Sara Teteak. The goal scoring began 58 minutes when sophomore Shelby Stewart took the ball at about the midfield line, dribbled down the left flank and cut inside for the finish. Kirstin Robertson found the net in the 81st minute for her ninth finish of the season. Robertson’s goal came on a follow-up on a loose ball. Robertson’s score secured the win for the Govs. Throughout the game, APSU’s depth played a part through the heat and injuries. In the 15th minute redshirt-junior, Morgan Jackson was subbed out with an injury. Jackson did not return to the sideline. The Govs used a total of 17 players to earn their second conference win. The Govs will take the field next against Jacksonville State on the road on Friday, Sept. 29.